Situated in Cheraw, this motel is within 20 mi (32 km) of Marlboro Country Club, Marlboro County Historical Museum, and Lake Wallace. National Railroad Museum and Coker College are also within 32 mi (52 km). This motel features an outdoor pool, coffee/tea in a common area, and a 24-hour front desk. Free continental breakfast, free WiFi in public areas, and free self parking are also provided. Additionally, free newspapers, RV/bus/truck parking, and a front-desk safe are onsite. 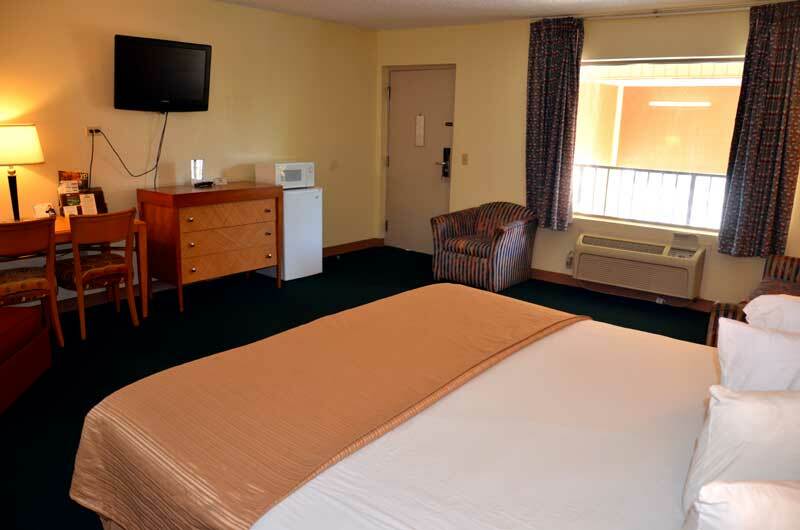 All 50 rooms provide conveniences like refrigerators and microwaves, plus free WiFi and TVs with cable channels. Guests will also find coffee makers, free local calls, and hair dryers. Activities : Come explore Cheraw's historic areas. Self guiding brochures are available for download and at the Lyceum Museum, Old St. David's Church, Town Hall, and the Cheraw Chamber of Commerce. Enjoy the award-winning Historic Cheraw Cell Phone Tour, dine in one of our fine eating establishments or shop in our quaint downtown village or sprawling highway 9. Follow in Dizzy Gillespie's footsteps, kayak on Lake Juniper, hike and bike in the sandhills, or play 18 on an award winning golf course. Enjoy our family-friendly Spring Festival to welcome warmer temperatures or the popular ChristmasFest each December. Plan now to come savor all Cheraw has to offer. Airport : Cheraw Municipal Airport, also known as Lynch Bellinger Field, is a public use airport in Chesterfield County, South Carolina, United States. Golf : You get the tee times you want, year round golf, two beautiful golf courses surrounded by woodlands and wildlife, 13 more courses within a 30 minute drive and affordable prices. Cheraw is located on the same sand hills ridge as the famous Pinehurst courses only an hour away. Cheraw is a great place to play a round of golf on your way to the beach or to bring a foursome for a fortnight! Government : Welcome to the “Prettiest Town in Dixie”. I'm extremely proud to be the mayor of my hometown. Cheraw is known for its friendly people, well-maintained neighborhoods, great schools, active churches, incredible parks, low crime and low taxes. We strive to maintain our small town atmosphere, while offering unique advantages that provide professional and personal growth opportunities. Hospitals : McLeod Health Cheraw has 59 acute care beds, along with an expanding list of cardiac, women's, surgical, orthopedic and other services. As part of McLeod Health, patients receive direct access to specialized services, improved technology, an outstanding physician network and enhanced facilities. We have the services you need here and now. University : Northeastern Technical College is a post-secondary institution which is accredited by the Commission on Colleges of the Southern Association of Colleges and Schools to award associate degrees, diplomas, and certificates. NETC is one of the 16 technical colleges that make up the SC Technical College System, an organization that has contributed nearly $2.5 billion to South Carolina's economy. During the same time frame, NETC had a cumulative economic impact totaling more than $47 million on its service area, which includes Chesterfield, Marlboro and Dillon counties. Welcome to our great hotel in Cheraw South Carolina with affordable rates and cheap budget discount lodging. Palmetto Inn and Suites welcomes you to our budget hotel in Cheraw South Carolina. Palmetto Inn and Suites will provide you excellent customer service with great amenities in comparison to all Hotels and Motels in Cheraw South Carolina. Please visit us on your next stay in Cheraw South Carolina and let us provide you with 4 star hospiitality for 2 to 3 star budget rates. Palmetto Inn and Suites has been providing lodging and accommodations in Cheraw South Carolina for sevral years and looks forward to providing our valued customer and business traveler with the best service in Cheraw South Carolina for Hotels and Motels in our local area. Stay midweek and get a 12% discount. 2 night minimum stay. Higher rates on weekends. Start your stay on Sunday and get a 15% discount.